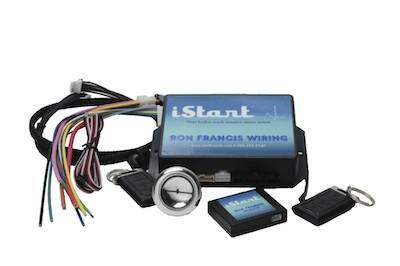 iStart keyless touch sensitive starter system. Main control box is 3-1/2" x 6"
Security Module is 3" x 4"
New from Ron Francis Wiring is a complete touch sensitive starter system with advanced security. This system simulates all five positions of a typical keyed ignition: Off, Accessory, On, Crank and Run. Touch sensitive button indicates different colors for each mode. Keyless Entry with full security: System includes security module with proximity sensors. Can unlock and lock doors as you come in and out of range. iStart button controls all typical key modes: iStart button is disabled until you come into range. Polished Aluminum iStart touch sensitive button can cycle through Accessory, Ignition, Start/Crank and Off mode just like a typical ignition switch. Jump directly to Start/Crank by touch and holding button. Switch takes a 1.25 inch hole. Retained Power Accessory Feature: Accessories kept live for 10 minutes after ignition is switched off or until door is opened. Easy to Wire: Purchase iStart with a Ron Francis Wiring kit and portions of your iStart system will be prewired for easy installation.